solidly and beautifully built. does generate some heat so you need ventilation. In substituting out SimAudio Moon P5, I notice an immediate increase in both bass extension & bass output. I know, I know. Not supposed to happen going from solid state to tubes, but it was obvious. Additionally, and immediately obvious, a more open and extended high end. I know; I know. Not supposed to happen going from solid state to tubes. I can't say the the BAT is warm or caramel, say like C-J; it is not in my system. It seems to be neutral and I have not noted any particular accentuation of any pitch or frequency. Outstanding detail both at low and high volume. Outstanding macrodynamic capability and remains composed even on complex music such as classical (i won't bore you with titles or composers). Put on a JVC XRCD of Miles or Trane, sit back and marvel. Its really very fine line stage. I just sent it in for the upgrade to 51SE status. We'll see. I'll let you know. BAT's new VK-50SE is amazing. It just disappears and does not put any of its own sonic signature into the music. When I initially inserted the VK-50SE in my system containing Wilson Watt/puppy speakers, the soundstage was dramtically increased. The VK-50SE is also the quietest preamp that I've ever heard. For those of you who feel otherwise, Ultimate Audio magazine, a magazine that's not afraid to write a negative review, gave it an amazing review. 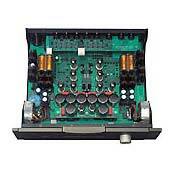 The reviewer said that the VK-50SE is the finest preamplifier to ever grace his system. If your in the market for a serious preamp give the BAT a listen. I just got back from the Consumer Electronics Show in Las Vegas. My friend has a Home Theatre installation company and let me tag along. We had a chance to demo a unique speaker called the Avantgarde Duo. It's a wild looking horn speaker. The Duo's were driven by an all BAT system including the VK50SE. The sound from this system was nothing short of breathtaking. It was extremely open, transparent, and airy. The system had the most incredible soundstage I've ever heard. Word quickly spread throughout the show of the incredible sound from the Avantgarde demo room and they were mobbed the second day of the show. Unfortunately, I'm one of those guys with a Circuit City budget (have to support family) and probably will never fork out the bucks for the BAT electronics. However, if my financial status ever changes, BAT will be at the top of my list. Is it me, or do the two negative reviews of this preamp thus far sound like their written by the same person. Normally I don’t like to comment on other people’s reviews. However, after reading the last reviewer’s comments I couldn’t contain myself. For whatever reason, Veda has it in for BAT. Because after trashing the BAT VK-500 he then trashed the VK-50SE. His advice to all of us on the internet is go out and buy a $500 Avid preamp, from Indonesia no less. Veda’s assessment of BAT’s products couldn’t be any further from the truth! First, you can not have harsh rolled off treble. It’s either harsh or rolled off. Second, the VK-50SE is a tube preamp. Tubes run hot and put out a lot of heat; that’s how they work. Saying the VK-50SE is hot or has a heat problem is like saying that an engine in a car gets hot. The fact of the matter is that in five short years BAT has developed a reputation for providing outstanding products at a sane price. BAT’s products have gotten outstanding reviews from every reputable high-end magazine out there. In fact, every BAT product reviewed by Stereophile magazine (about a half dozen) has been put in their Class A recommended components list. Last month Jonathan Scull gave the VK-50SE an incredible outstanding review. I’ve listened to the VK-50SE on many occasions with different equipment. The VK-50SE is musical, detailed, airy, and very revealing. It throws out a huge soundstage that will wrap around you. I’ve compared the VK-50SE to very high priced preamps from Conrad Johnson, Jeff Rowland, and Mark Levinson and in my opinion the VK-50SE is a more musical preamp. It draws you into the music with its timing, pace, and incredible dynamics. In addition, all of BAT’s products are built like tanks so I would think there going to last. As far as the BAT bashing goes, often people trash products for whatever their agenda is. I would hope that anyone spending thousands of dollars on a preamp would trust their ears instead of some unknown reviewer on the internet. Wow, there seems to be a bad case of diehard fanatics here. Anyway, this is a very weird tube component. It sounds just like SS but since it uses tube, it has the grainyness tube equipments possess. I don't think this is a sound concept. The poster who gave less than favorable ratings below probably detected the same thing. You can get the same result from some cheap SS component so why even bother? But then you won't get the extra heater benefit. In my system it opened up a whole new dimension in sound that I never knew existed. Till you put this in your system you don't know the information that your missing. Note the specs to 100Khz, there is alot of harmonic information that affects the sound within the listening range of the ear that other equipment doesn't reproduce. BAT Tube Gear does it. Don't expect allot out of it till there is 100 hours of operating time on it cause it will change significantly. Moved from a 5i to the 50SE as part of an almost complete system upgrade. There is now a 5i to 5SE upgrade available, which was not available at the time. After a couple of weeks of break in and a lot of tweaking with the speaker location (of course) the system sounds just wonderful. Detailed, neutral, and a big step up from my previous system, which itself was quite good. The only thing this preamp seems to give up to absolute neutrality is a very very slightly emphasized top-end. However, this has been slowly going away as the system breaks in. The new configurable user interface and remote are a big bonus and the cosmetics are even better than the 5i's.Wonderful. Do you want to read a true story about awakening into Audiophile reality? I’ve owned a Wadia 860x CD player and Martin-Logan reQuest speakers for 3 years, all hooked up through a Sony receiver. I thought they sounded great, but was I wrong! Recently, I bought a VK500 amplifier, a VK50SE preamp, Nordost Quattro Fil interconnects and Red Dawn Rev.II speaker cables. After 200 hours of nasty noise from my XLO break-in disc, the system sounded good, really good. The system sounded better than my own very high expectations (validation of my buying decision – MARVELOUS!). I found the system utterly engaging. I poured through every CD I owned and rediscovered music I had long forgotten. Every CD I played sounded good beyond my expectation. In fact, the performance of the Wadia and Logans, leapt to a mind-boggling level of sound quality, driven by the BAT equipment. Detail that I never new existed on my favorite CDs suddenly appeared! Let me rephrase that, Detail that I never thought could be placed on a CD suddenly appeared! The balanced Audio Technology equipment caused a glorious transformation! As 300 hours passed, the system progressively sounded better! I realized that the language I began using to describe the sound to my friends mirrored that of Stereophile magazine’s finest reviews. Laser focused detail, lifting veils, musical fluidity, palpable sound, blackness, air, extended highs, clearly defined lows, invisible speakers, live breathing musicians on a wide, deep, clearly defined sound stage- suddenly I understood exactly what those colorful descriptors meant! As 400 hours passed, the soundstage expanded and fell backward off the speakers, instruments developed a tightly defined focus around which complete blackness formed, and, on a good recording, the soundstage emanated from a point behind the back wall and spread easily beyond the side wall. At the same time, a breathtaking, gently articulated back to front reverberation attached itself to focal voices and instruments that continues to send chills up my spine every time I hear it. I had no idea this level of engineering and sound reproduction was possible! As I write this, I feel I risk sounding foolish. I feel as though I’m describing the sound characteristics of the high 5-figure systems utilized for many of Stereophile’s component reviews. Yet, the sound of this low 5-figure system conveys a level of musical clarity I’ve never heard in any audiophile showroom in Chicago. The BAT equipment mated to Martin-Logans through Nordost cables is stunning. The ReQuests turned out to be better than any speaker I’ve heard under $15,000. Nordost cables are magical, and I’ve never heard anything more neutral than Quattro Fil in their price range. I’m not forgetting the Wadia 860X. It is the source – say no more. Every time I hear the sound of my system improve, I feel a deeper respect for the astonishing quality of Wadia products. Without the ability of the Wadia to produce an audiophile source signal, the downstream components would be fighting a lost battle. So, here’s the point about awakening into audiophile reality. Reliable information is the key to making the right investment and getting the most from your investment. It is clear to me, that without the information I obtained from Audio Review, Stereophile, manufacturer’s websites, and discussions with experts, I would have either made a purchase mistake, or, even worse, never heard the true potential of the equipment I purchased. You just read reliable information. I have Aerial 10t speakers, Levinson33H amps and for cd playback I use either a BAT VKD5 or Sony SCD777ES. There really are no words which accurately describe the intense and beautiful emotions one experiences from listening to Victor Khomenko's equipment...BRAVO!! !